Please program the keys into the lock before installation, or you only can hear two beeps without opening. If meet any problem, please contact us via Amazon, and we will reply with solutions very soon. Simple, Easy, DIY, needn't open a hole on door, install at right angle(door and side), it's perfect for wooden door, cabinet, drawer and locker. 1). Fill 2xAA 1.5V Batteries in the lock, and you can add RFID Cards. Two models, you can change by yourself. 1. User card to unlock(this is perfect to use at home). 2. User card + Management card to unlock(this is perfect to use at business, such as hotel, massage etc). 2). Fix the lock at inside of cabinet. Close it. Two Unlock Modes: User card to unlock(this is perfect to use at home); User card + Management card to unlock(this is perfect to use at business, such as hotel, massage etc). This Electronic Cabinet Lock Kit Set is used for cabinet, drawer, locker, storage box and etc. for household or business: supermarket, sauna club, gym, swimming stadiums, library, factory and office. 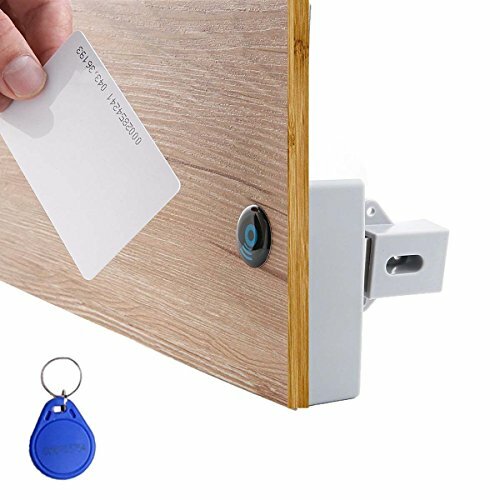 Use ID card to touch outside of cabinet, it lock will flick and open the door(Note: the tag only can be used for Max.2.5cm thick door, the ID card can be used for Max.4.5cm thick door). It can provide good safety protection of your personal items while protecting your privacy. It also can improve children's safety at home, avoid your children or kids free to open the drawers or cabinet doors. What You Get: 1x Lock without batteries; 1x ID Tag(Blue, work at about 2.5CM distance); 1x ID Card(work at about 4.5CM distance); 1x Pack of Screws. If you have any questions about this product by Diconna, contact us by completing and submitting the form below. If you are looking for a specif part number, please include it with your message.